While I predominantly reside in Tacoma, Washington, I do venture up to British Columbia quite often, be it for pleasure or business. I normally don't bring my camera, but this last week on my latest trip north, I did bring my camera and took some photos. My photos are less than brilliant, but they do offer an insight into British Columbia's current (and former) signing practices. I will post more photos tomorrow, but I wanted to get the ball rolling tonight. I don't know why I never finished posting to this thread. Here's the rest of the photos I took that day. 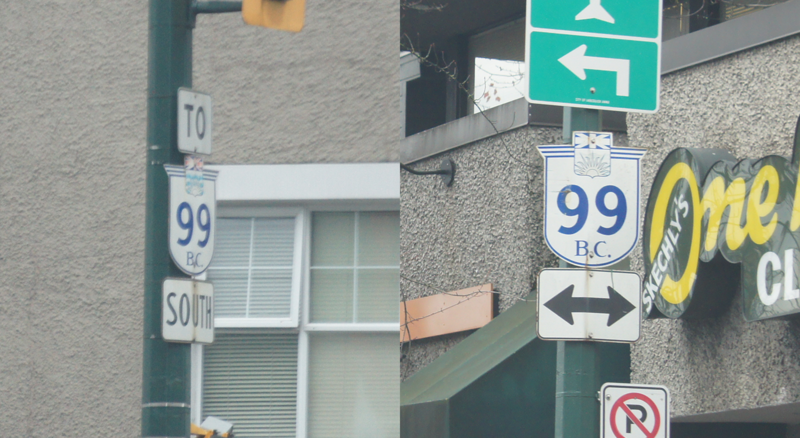 These photos demonstrate modern BC MOT signing practices (except the last photo, which is obviously a one-off abomination). This sign is a disgrace, but it's worth showing anyway. One-off mess, with down arrows (weird) and all-caps (weird). To me, that looks like airport signage. This is some interesting stuff! 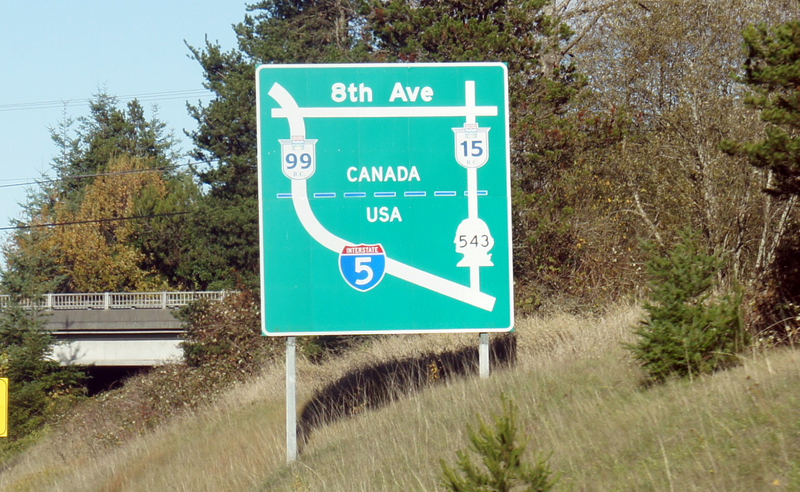 I don't know why I've always found Canadian signage so intriguing, I guess because it feels like just a slight variation from the US signage that I see all the time. 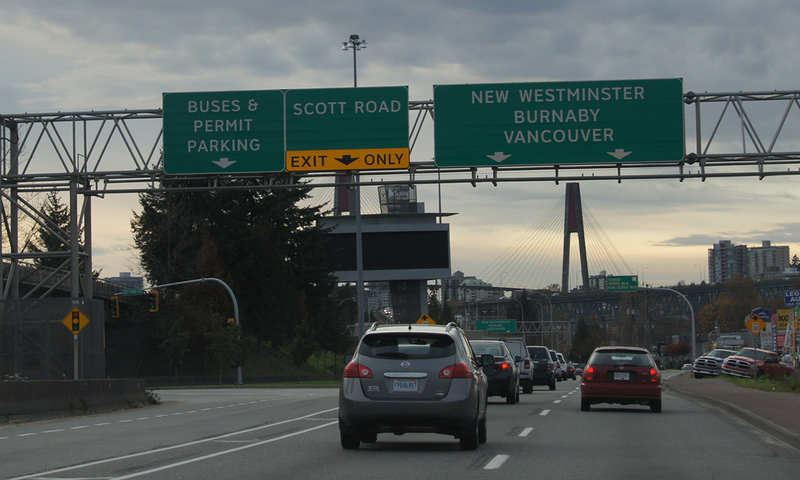 I've always liked the way that BC signs their HOV lane exits. I liked the purple strip they used to indicate the toll bridge on it's pull through signage for the Port Mann bridge as well. Luckily the airport signage at YVR is a hell of a lot better. Slight variations that might make them non-compliant in the US. I certainly prefer the TAC's more lax approach to signing, allowing provinces greater control. I quite like BC's liberal use of up arrows, but no other province widely uses the style (Ontario does, to a degree, but only at exits). 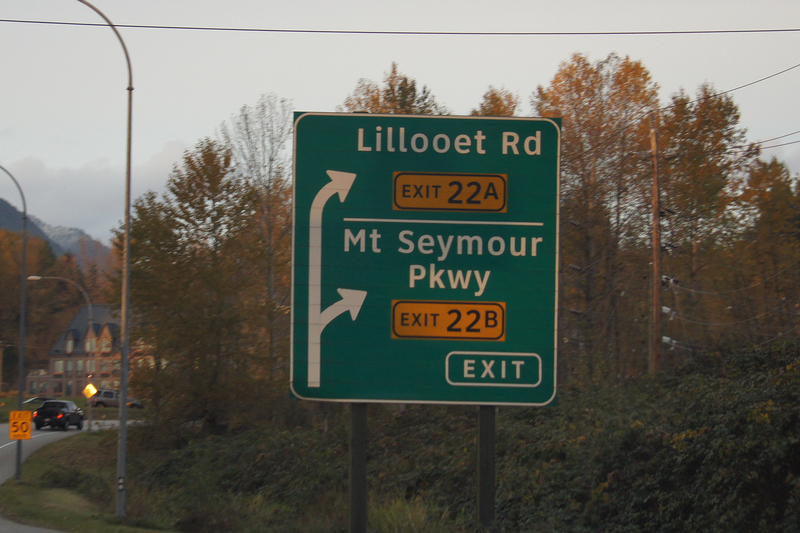 Their HOV signage is more MUTCD-compliant than those in WA. I like it too. Without any toll bridges now, all those purple strips are gone. I loved them too. Made it very clear which facilities were tolled. Actually, I forgot to ask a question about this sign. Why does the HOV exit get a different letter? I can't think of another place that numbers the HOV exits so I can't draw a comparison (growing up in CT, we didn't have numbered HOV exits). They potentially reduce weaving, as drivers can follow inside exits as well as outside ones. But I couldn't say for sure. 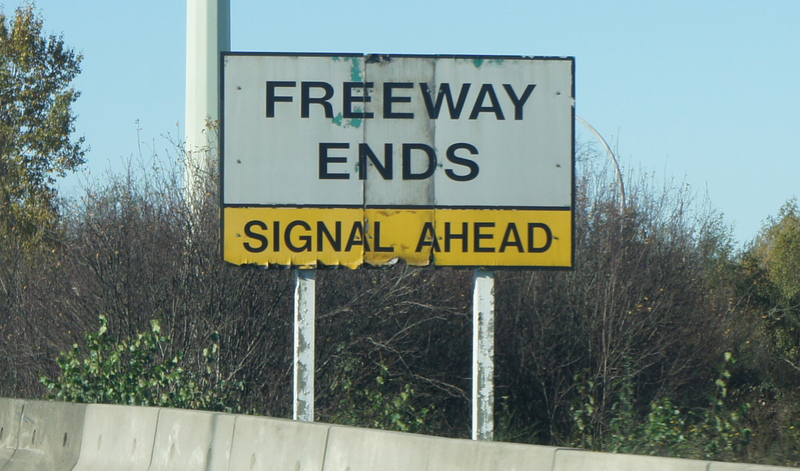 The province only started constructing HOV exits ten years ago. As silly as it may sound, it's probably just because whichever engineer was in charge when they built the first HOV ramp just thought the HOV ramp should have a different number or suffix. Decisions like that are often somewhat arbitrary. I prefer using a different number because in fact it is a different ramp. Sure the main ramp and the HOV ramp both get to the same place, but they are different ramps nonetheless. Is there a standard of numbering HOV ramps in the US? I don't recall seeing exit numbers on HOV ramps on the roads that I have traveled. I'm not sure about the US, but there doesn't seem to be a standard in Canada. The only other similar example to the Grandview exit pictured above that I can think of is the HOV ramp to the 401 from the 404 in Ontario. In that case, both the HOV and GPL exits are signed as Exit # 17. I don't think there are any other comparable examples in Canada. BC has other HOV ramps, but they are mid-block between GPL interchanges, and Ontario doesn't have any mid-block HOV interchanges (though some have been proposed in the past). Quebec has some HOV lanes on their highways, but they don't have any HOV specific interchanges. There is a bus only ramp from the median of A-740, but it doesn't carry it's own exit number. Why ever not? I never go anywhere without bringing my camera. 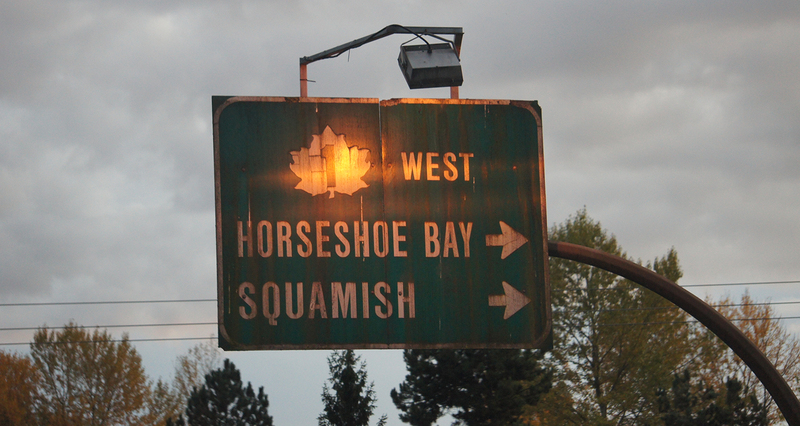 As for the signs pictured, this does remind me of one of my pet peeves of signage in the area - namely, that the exit numbers on TCH 1 act as though it begins at the ferry dock and completely neglect Vancouver Island. Regarding HOV or HO/T exits, here in Northern Virginia they are not numbered, and I note we have a few HO/T lane exits that do not have general-purpose-lane counterparts. Utah numbers HOV exits IIRC. There is only one HOV exit in Utah, and that's from northbound I-15 to 400 South in Salt Lake City. While it is numbered 307, that might only be to match the southbound counterpart, which is a general-purpose exit. I have my phone camera on me all the time, of course, but I hardly ever bring my Sony DSLR with zoom. Mostly I just don't keep it charged. And I'm not usually in BC to take photos specifically, so it's not on my "trip checklist". My new phone has a zoom feature (optical, not digital), so now I'm even less likely to bring it. Never noticed that. I believe the freeway opened as the 401, not TCH (which was routed elsewhere except in some parts), but when the 401 designation was dropped, they never switched the exit numbers to the new TCH mileage.